Jubb and Cois committed to protecting and processing your personal data in accordance with the General Data Protection Regulations and the Data Protection Act 2018 (the legislation). 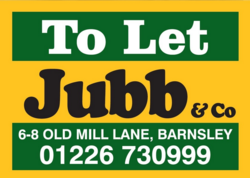 For the purpose of the legislation and your personal data, Jubb and Co, is the Data Controller, Caroline Jubbis the person responsible for data protection and can be contacted at 6-8 Old Mill Lane, Barnsley, South Yorkshire, S70 2LA, 01226 730999. Where the lawful basis for processing is your consent, you may withdraw consent at any time by writing to, Caroline Jubb, Jubb and Co at 6-8 Old Mill Lane, Barnsley, South Yorkshire, S70 2LAor emailing caroline@jubb-co.com . Name Staff Over the phone/in person/email To address correctly Contractual fulfilment Staff Paper/Cloud based software 6 months after appraisal if not going ahead with transaction If Landlord decides to go ahead with using our services this informaion will be retained throughout the transaction under the basis of Contractual fulfilment. Please see LL - current and past policy for further details.